Drew Gulak battles The Brian Kendrick in a great opener, and Lucha House Party faces Mike Kanellis and TJP in a tornado tag match in a good episode of 205 Live. The SmackDown quarter finals are decided as Fabulous Truth faces Extreme Flair, and Day One Glow takes on Awe-Ska. 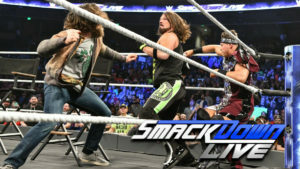 The new Daniel Bryan continues to establish himself, Styles faces The Miz, Rose and Deville attempt to make a point against Asuka and Charlotte, Samoa Joe instructs Jeff Hardy on responsible drinking, and New Day, The Usos, and The Bar try to gain some momentum on a good episode of SmackDown Live.